Hello all. Had a great time up north this year, cant wait until next year. Actually got to leave the women at home and brought my brother and our oldest boys. Only got food poisoning once, ok, maybe twice, but still, no nagging! Anyway,heres the deal. I do not have a boat and would like any advice/tricks you guys and gals may possess on fishing from shore for both walleye and musky. We actually have a couple lakes down here in Nebraska with both. Any advice is appreciated (unless its telling me to get a boat, I know). I have never fished for musky so I will have to leave that for others to comment on. But for walleye from shore I like to use a lindy rig type set up. It allows you to fish the bottom easily and it gets the bait into the strike zone. It also allows the fish to pick up the bait without feeling much pressure if you leave the spool open. The one problem with shore fishing is that you will be limited to what areas you can fish. It will take some luck as you will need the walleye to come to you instead of you going to the walleye. Usually in the fall is the best time for shore fishing walleye becuase they tend to move shallow to feed. There have been a few times when I was shore fishing in the fall and had two of us limit out on walleye in just minutes. Shore fishing will take the cooperation of the fish but if you are doing your part you can increase your odds a little. As to the food poisoning,I'd recommend to use little soap on dishes.Having a residue can make you get the squirts & develop cramps. being a BWCAW week tripper ,I've seen this all to often. I fish from shore on the river & lindy rig like no fish showed in the diagram.I also cast and retrieve a jig with a sassy shad body that mimics a minnow.Both produce walleyes.Buzz bait in logans can be deadly for big pike & bass & musky. Wonder why they scheduled Nichols State this year? I'm sure lot's of guys have favorite presentations that have worked for them at various times. However, the real question is this-WHAT TYPE OF WATER ARE YOU FISHING FOR WHAT SPECIES AT THE TIME? The answer to that single two part question determines the presentation to turn to. You said you were after muskie/walleye. That gives us a good start on an answer. Walleye--first of all it is critical to understand the biological clock of the walleye and how it is played out on the body of water you are fishing. For example--if you are fishing a 1500 acre natural lake with 10 feeder creeks in the period just after ice out then the majority of the walleye will be making spawning runs up the creeks and you can implore river fishing 101 techniques(current breaks, current edges, holes, boulders, etc. often best at low light and possible suspended fish in main lake basin directly in front of the creek mouths at same depth as creeks) Your car/feet have become your boat--so you may want to set up a route that takes you to say 5 bridges that cross the creeks and hit the highest percentage 5 spots within a half mile of each bridge in one afternoon. That lets you hit maybe the 25 highest percentage spots in one afternoon. About the same as you would do in the boat--only done differently. It is the same game--you just play it a little differently when not using a boat. Again, depends on what water type is available--we can fine tune a bit after that is known--WHAT TYPE OF WATER WILL BE AVAILABLE TO FISH? Rivers, small streams, deep lake, shallow flats, weedy bays,small weed choked lakes and ponds, etc., etc. all have very different ways to be fished that are effective but unique to each type water and species targeted. Muskies--ahh, shore fishing for muskies. If there is a dam on a river that has muskies this time of year they will generally start moving toward the deeper water and holes, although the flats can at times be exceptional for giant fish in the fall. Current breaks close to deeper water are the most magic magnet though. The fact that there are not a lot of muskies makes them a bit more difficult though. However, here is a great technigue that is dynamite for shore fishing muskies in the fall to winter seasons. Find the most prominate, giant point you can that touches the main lake basin (If it has boulders and weeds that makes it much better). Buy or catch some 6-20 inch long suckers (If you can't find or catch any then bluegill and carp are OK bait options--not as good but ok--they are legal in most states for bait but check local regs--bluegill are not legal bait in Minnesota as I understand it) Then soak one of the suckers on a quick strike rig under a muskie float about half way between the surface and the bottom. 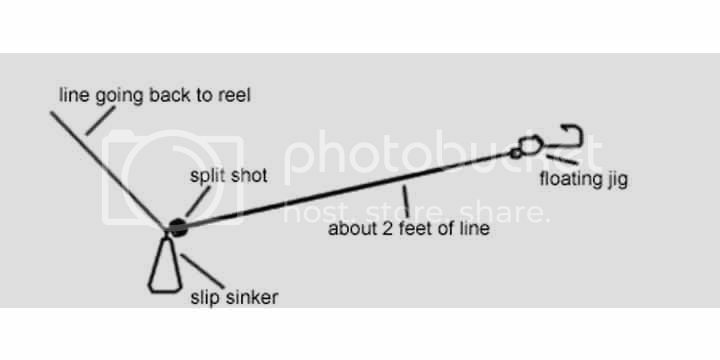 Soak a second one on a similar quick strike rig under a muskie float but set the depth on this one for maybe 2-3 feet from bottom. This way you have a good coverage of the water column. Cast them out a good ways and set back, build a fire, toast a cheese sandwich and take in nature. If there are muskies in the lake the will eventiually be swimming this main lake point at some time in the day (presuming the lake has muskies). When they do you have a VERY GOOD chance at hooking up on a couple in the day. Also, I have found it good to use one larger sucker and one smaller so they have an option no matter how they feel. This is a great method in fall--but very poor in spring because they are located elsewhere in a lake early in the year. Another consideration for both these (or any species) is what there prey species are up to at this time. Muskies and big walleye will be with their food target species. As an example--muskies in a lake with good populations of tulibee/ciscos/whitefish will be on rocky main lake points as the water temps go below 50 degrees and the ciscos/tulibees move there to spawn--well if the lunch ticket is there so are the big boys. Incidentally, the fall ciscoe/tulibee spawn will concentrate almnost every giant fish in the system--from muskies, pike, to walleye and smallmouth. Best chance to have contact with lots of big fish at a specific location at one time--YOU GOTTA LOVE THAT!!!!!!!!!!! Well there are a few things to consider--the specific lures/bait to use will be determined by the type water you are fishing,prey species location, and the other factors to bring into play--after all it does no good to fish a Rapala minnow 6 inches under the surface if the walleye you are targeting are suspended at 30 feet deep off the point! If you have any more specific information on the waters you are fishing then let us know and I, or others, can give you a little more specific information on how to approach it. If a person is just going out chunking a few lures/bait off any shore that happens to have a park and mowed edge then it probably doesn't matter much--but if you want to put in a little research on the waters/tributaries/prey species/under water contours/etc. then you can ABSOLUTELY be VERY successful in your angling pursuits from shore. It is the same game--just played a little different and you have to see your vehicle and feet as your boat taking you to high percentage spots a high percent of the time. As my old pappy used to say, "The secret to being a successful fisherman is putting high percentage lures/bait in high percentage spots a high percentage of the time!" Let me/us know of any more specific info on your spots and I bet we have some good ideas on more specific presentations to help put you in contact with a few more fish. One thing also to keep in mind is the number of lines you can have out at any one time. In minnesota you won't be able to fish 2 lines so when using the musky technique you will have to stick to just one bait and one line per person.